AlphaNinja: I'll take that, thank you very much. 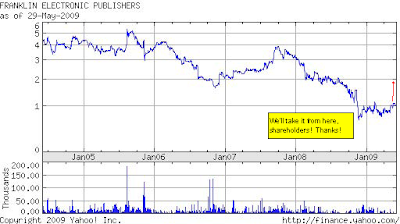 AlphaNinja - While it's usually a nice sign to see management own a chunk of stock, it's best to be well aware of management's "intentions" if you will. BURLINGTON, NEW JERSEY - June 1, 2009 Franklin Electronic Publishers, Inc. (NYSE AMEX Equities US:FEP), a worldwide leader in providing language and related technology solutions, today announced that it has received a copy of a Schedule 13D filed with the Securities and Exchange Commission relating to a non-binding proposal by Saunders Acquisition Corporation for an all cash acquisition at $2.35 per share. According to its Schedule 13D filing, Saunders is a newly formed Delaware corporation founded by existing management of the Company who, together with existing shareholders who are members of the Saunders group, beneficially own shares or options to purchase shares representing 43.7% of the voting power of the Company. Taking into account only options expected to be exercised at the time of any vote on their proposal, such persons will own 39.9% of the voting power of the Company. Franklin’s Board of Directors has appointed a Special Committee comprised of independent Board members to consider the Saunders proposal and other proposals.